Thanks to an article in the Calgary Daily Herald, I had known that “Chin Chin” played in Medicine Hat, Alberta sometime shortly before January 8, 1920[i]. I finally found an article regarding “Chin Chin” playing in Medicine Hat[ii]. We now know that “Chin Chin” played in Medicine Hat on January 5th and 6th. Page 8 of the Medicine Hat Daily News dated January 6, 1920 has a nice article regarding the show. I know that “Chin Chin” played in at the Avenue Theater in Vancouver on Dec 25-27[iii], but still don’t know where the show played during the eight days before Medicine Hat. After the show, the company headed back west the 100 miles to Lethbridge, Aberta for one night there before heading to Calgary. 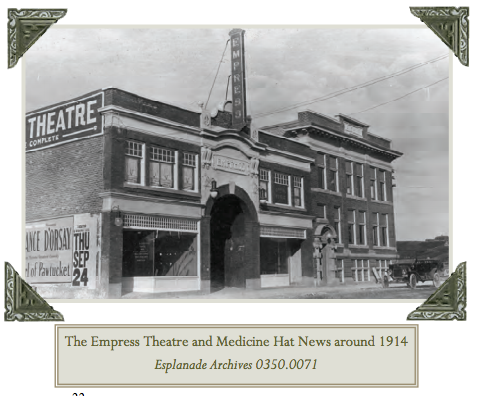 The Empress Theatre was built in 1913 at a cost of $25,000[iv]. It was located at 10 Sixth Ave, Medicine Hat and seated 625 people[v]. The theatre was said to be the best-equipped theatre between Vancouver and Winnipeg and hosted vaudeville and local theatre productions during the early years. [vi] In the 1930s, the theatre made the switch to movies with occasional live performances. The theatre was closed in the late 1940s and was demolished in 1953[vii]. Today the site is occupied by the Medicine Hat City Hall. [i] See Donna & “Chin Chin” Play “The Grand Theatre,” Calgary, Jan 8-10, 1920. 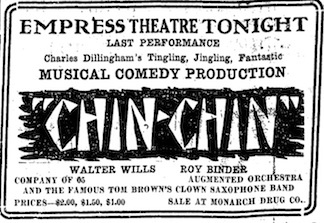 [ii] Medicine Hat Daily News, January 6, 1920, Page 8, “CHIN CHIN” AN ATTRACTION DE | LUXE IN MUSICAL COMEDY LINE – Last Night’s Audience Was Delighted With This Breezy Footlight Attraction – A Show of Special Features (via Newspaper Archive). [iii] See Donna in Vancouver, BC, Canada, at the Avenue Theater –December 25-27, 1919. [iv] Archives Access – 2010 Edition – “In the Limelight” Issue – Esplanade Archives – Arts & Heritage Center. Page 22.